We are having quite the heat wave in Germany right now. 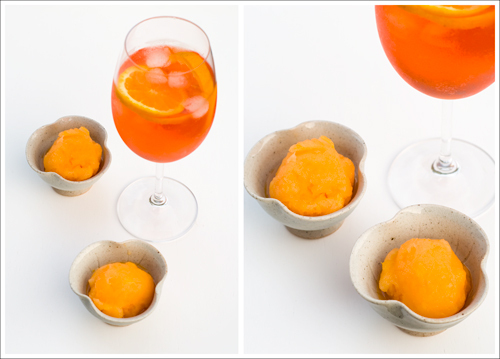 So, instead of tea I like to spend the afternoon with one of my favorite summer drinks, the Aperol Spritz. 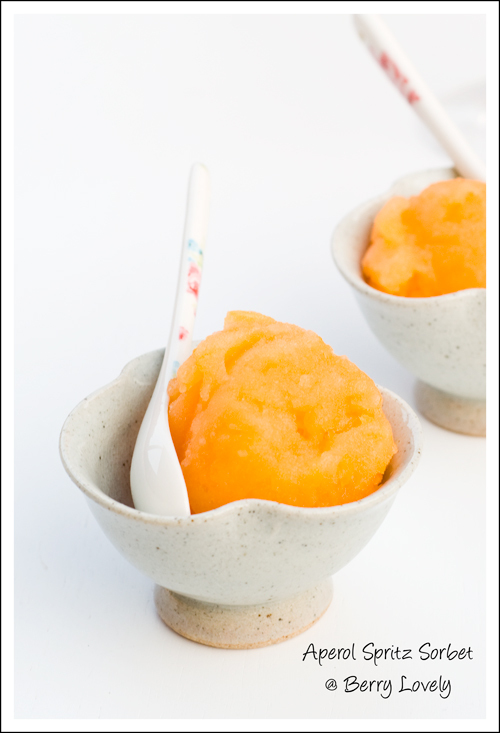 I love the flavors of sweet oranges, bitter Aperol and sparkling prosecco and wanted to put them together into a fruity sorbet. The sorbet turned out really refreshing with just a hint of bitter. A perfect snack for a hot summer day! Put the sugar in a small saucepan and cover with some orange juice, just enough to saturate it. Heat until the sugar is dissolved while stirring frequently. Add the sugar syrup to the orange juice and mix well. Also stir in the prosecco and the Aperol. Cover with plastic wrap and refrigerate for at least 2 hours. Freeze in your ice-cream machine as directed by the manufacturer.